TOWNES VAN ZANDT : “THE LATE GREAT TOWNES VAN ZANDT” LP….. I went through a major TOWNES VAN ZANDT phase around 1993-94, after a pal with excruciating quality-control standards successfully convinced me to investigate this 1970s Texan folky/alcoholic poet/country-music bard. 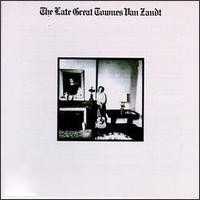 After buying this record, “The Late Great Towns Van Zandt”, first, and then working my way pretty deep into the man’s extensive back catalog (much of which had then been recently reissued by Tomato Records), I came to the conclusion that Townes was a pretty first-rate songwriter and a titanic teller of tales of woe. I played the living hell out of this record and my other favorite of Townes’, “Live At The Old Quarter, Houston Texas”, and more or less ignored the other ones because I thought they seriously paled in comparison. Why, I still believe that to be the case. I even saw the man play live in San Francisco a couple of years before he died, and though I couldn’t find a single punker willing to attend the show with me, I had a grand time watching the then-old fella croak his way through his own material and covers of the Stones, Hank Williams, etc. When he died in 1997, the maudlin tributes and posthumous 20/20 hindsight began, and all of sudden Van Zandt was a full-fledged legend (hey, he earned it). I filed the two records I’d kept, and only this month brought them out again for this decade’s appraisal. One temptation I try very hard not to be privy to is to loft tragic figures like Van Zandt or, worse, the media-sainted GRAM PARSONS, into some critical role-call Valhalla just because they up & died from their personal problems. I mean, it goes without saying that lionization of the young and the dumb and the unfortunate many who get saddled with drug/alcohol/depression problems is pointless if there was precious little to back it up in the first place (again, Parsons – who I do in fact like, yet am somewhat bewildered by his ever-growing beatification). Van Zandt, at least, had this wonderful record, a 1972 peek into his melancholy, often deceptively playful worldview. My estimation of it hasn’t diminished in the least. It’s certainly more of a “country” record than anything else I’ve heard of his, with some pedal steel and mournful-sounding instrumentation that slots only into the C&W genre. He’s been described as a “hillbilly Leonard Cohen” at times, and nowhere is this more evident than in the haunting and sparse “Sad Cinderella”. The one you might recognize here is the jaunty “Pancho & Lefty”, still his most popular song thanks to Willie Nelson, and still my #1 favorite of his. Unlike other records from what most consider to be Van Zandt’s most fertile years (1968-1975), there is virtually no filler on this one, and everything from the cover photo to the closing bells of Track #11 (“Heavenly Household Blues”) bespeaks a plaintive, lonesome troubadour, a man beholden to no known trend or musical movement. I think he’s been embraced by honky-tonkers, hippies and indie rockers in equal measure, and if there’s a single recommended place to begin investigating such a chameleonic beast, it’s right here.